Appetite Correction (AC) is a revolutionary new focus in weight loss based on ten years of user experience with Dr. Bert’s ground-breaking guide to daily intermittent fasting, The Fast-5 Diet and the Fast-5 Lifestyle. AC means getting your body’s appetite center working again, so not only do you lose excess fat, you lose it without being hungry, and once you’ve lost the weight, it stays off if you maintain the flexible, low-effort AC lifestyle. When the appetite center is working properly, you don’t want to eat more than you need. You work with your body instead of fighting it! average sustained weight loss of 44 pounds! $2500 saved annually on food costs! 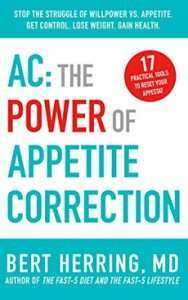 Learn how in AC: The Power of Appetite Correction, which provides 17 non-drug, non-surgical lifestyle tools that have worked for countless people to reduce appetite, so they experience freedom, power and control over food with no need to count calories, exercise or eliminate any foods or food groups.